In February 2018 Colchester BC ran the final 6-week consultation on the Wivenhoe Neighbourhood Plan and began work on appointing an examiner. In May 2018 Ann Skippers accepted the appointment. After the consultation finished, the WNP Review group reviewed the responses of all consultees and in mid-June sent its comments via CBC to the examiner. A hitch in progress occurred in July, caused by a ruling by the European Court of Justice, which led to an amendment by the Government of the Neighhood Planning Regulations. This meant that the Habitat Regulations screening report of the WNP had to be augmented by an Appropriate Assessment which was carried out by CBC. All this delayed the examination of NPs nationwide. In November, the Plan Review group received a number of questions for clarification from the examiner. These were dealt with and returned after the group’s meeting on 10 December. Unfortunately the addition of the Appropriate Assessment required yet another consultation, which will run from 9 January – 20 February 2019. All parties are now working towards a Referendum date of 2 May 2019 which would coincide with Wivenhoe local elections. After submitting the Neighbourhood Plan and allied documentation to CBC for a compliance review in September 2016, the need for further amendments and refinements became clear. This work resulted in detailed work on the structure of the neighbourhood plan itself and updates to various other documents, all of which have since been placed on line. The Wivenhoe Neighbourhood Plan was re-submitted for a compliance review in December 2017. The town-wide consultation questionnaire was completed at the beginning of January 2014. The analysis of all the data took many volunteer hours and weeks and a Digest of the results was placed on line. The Digest is also available as a 12-page A5 size publication from the Town Council offices at 77 High Street and can be obtained at various venues around the town including the Library. Countryside, river and environment issues including: Biodiversity, different uses of outdoor green spaces and water for leisure, maintenance and preservation of green areas. Heritage including: History, development, character, conservation and preservation needs. Community, facilities and or leisure activities including: Sports, Allotments, Cemeteries, Playing Fields, Health Centre, Schools and Adult Education. Traffic and transport including: Roads, Parking, Bus, Train, Cycling on highways. Residential development and land uses including: Housing generally, Green Areas within Development, Types of Building, Locations, Ownership/Renting options. Economic and business development including: Retail Outlets, Business Premises and Sites, Needs of Self Employed, Homeworkers, Employment Opportunities. Infrastructure needs including: Utilities in general e.g. Communications, Power Supply, Water, Waste Disposal, Alternative Energy. 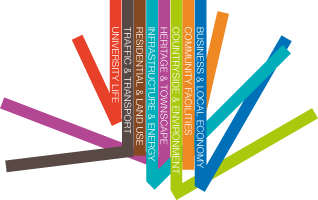 The University including: Employment, Community Engagement and Facilities, Expansion Plans. These groups examined the feedback from the community and brought forward their reports to the steering group. Some of the feedback was not capable of being translated into policies for the plan because only issues that require planning permission can be made into policies. Nevertheless, the Plan can include ‘proposals’ or ‘projects’ (the terminology varies) that are aspirational so where a significant number of respondents highlighted such an issue, it was not ignored. The upshot of the above was that the steering group brought forward a Vision statement and policy proposals for a Community Consultation that was held in November 2014. 172 residents came to the consultation venue on the day to leave comments. Another 1386 votes on the proposals were collected in the on-line survey that ran until 4 January 2015. These data will be added to published material when tidied up (man-power issues!!) but were available for the formulation of the Vision & Objectives document that in turn will inform the draft policies of the Plan. The eight working groups that brought the work to this point were disbanded and three new ones formed to take the work forward into its pre-drafting phase. They are: Land Use & Zoning group, Community Engagement and Consultation group and Policy Writing group. Since January 2015 t he LUZ group has been working on the mammoth task of preparing the Strategic Environmental Assessment scoping report and in June the finished paper went on line. The group has also examined potential development sites and produced a Scoring methodology to determine site suitability, and is working on proposals for preferred sites. On 29 June all this preparatory work was handed over to a planning consultant, to begin writing the first draft of the Plan. We expect to see this first (outline) draft at the end of July. Another public consultation was held on 11 July 2015, when residents were invited to give their opinion on proposals for housing development sites brought forward by the LUZ group. Comments left on that day will inform any amendments that may have to be made to the first draft of the Plan. The results of this consultation are currently being analysed.